We are dedicated to keeping our customers safe and warm during the cool months and year round. Our Keep Full Customer program provides you peace of mind that you’ll never run out of gas. If you have a leak, call us and we’ll send a highly trained technician out to get your system back up and running as quickly as possible, 24/7. We monitor your gas usage to provide peace of mind that you will never run out. Our integrated technology allows for us to schedule automated fill ups. Additionally, our staff monitors forecasted weather conditions to make sure you are never caught by surprise. In order to save money and run the most efficient propane gas appliances and heating units, maintenance is essential. Our trained professionals do annual maintenance to ensure that you are using your fuel in the most effective manner, and safely. Our trained and certified professionals can help you utilize the benefits of high effective propane gas in your home. The most important part of beginning to utilize the cost saving fuel is a proper installation. From running lines, placing tanks, and lighting the pilot, a professional installation is essential for safe use. If you aren’t currently using propane as your main gas source, contact us to learn more about the benefits. Propane gas is highly cost effective, highly efficient, and better for the environment than other gas and fuel options. Contact us today to learn even more! We offer the easiest and most effective online management tool so that you can manage your use, bills, and communication. With our integration with RCC you have the ability to pay your bill online from anywhere. Additionally, you will be able to track your use from month to month. 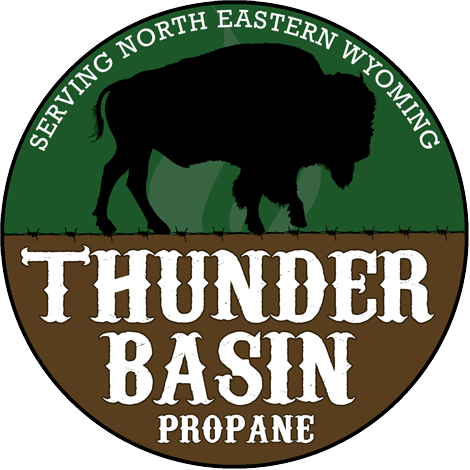 Thunder Basin Propane Company has been delivering and providing highly efficient and cost savings propane to commercial and residential users across North Eastern Wyoming. Our company goal is to provide you with the best customer service, and the most competitive prices for your propane gas needs. Our service providers are dedicated to providing timely delivery, professional installation and care, and an answer to every question you may have regarding your system or needs. For more information please contact us so that we can begin to work together! Begin receiving the peace of mind that you deserve! Our warehouse was not heated prior to Derrick approaching us about the opportunities and benefits of adding it. We have been able to use it to keep our staff warm, and sell the benefit to our customers. – Kyle, P.
Thunder Basin has kept my family and our home warm for years. I couldn’t imagine having to work with anyone else. Kevin S.
I have been using Gary’s for the last 12 years. We are lucky to have them as our local company. They have friendly staff and have always stayed true to their best price attitude. Thank you for keeping my home warm in the cold winters! – Dave C.
Thunder Basin Propane. Here to keep you going!